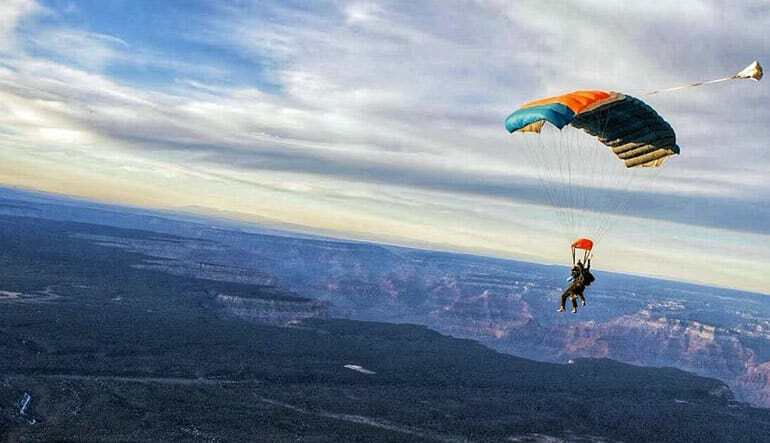 Yes, you heard right: this is Grand Canyon skydiving. No other dropzone in the world offers views like these! Gravity takes hold. You accelerate, freefalling back to earth. Seconds feel like minutes. At your fastest, you’re plummeting at 124MHP! But this isn’t just any tandem skydive. Grand Canyon sights sprawl out all around you—it’s the only jumping experience of its kind! Yes, you heard right: this is skydiving. No other dropzone in the world offers views like these! With the Grand Canyon’s South Rim as your backdrop, your tandem skydiving experience begins with a pre-flight training. Because a qualified Tandem Instructor is strapped to you for the dive, you’ll simply need to learn a few basic maneuvers—the experienced Tandem Instructor looks after all the hard stuff. Next, you’re geared up and on the aircraft. On the flight up to jump altitude, enjoy panoramic views of the Grand Canyon South Rim. The flight lasts around 15 to 20 minutes, so you’ll have lots of time to kick back and appreciate the scenery. Adrenaline starts pumping. Your jumping partner informs you you’re approaching the spot. It's now or never. The door opens, you peer out onto the vast chasm. You feel a tap on your shoulder. It’s your tandem diver. “On three!” he says. One… two… JUMP! 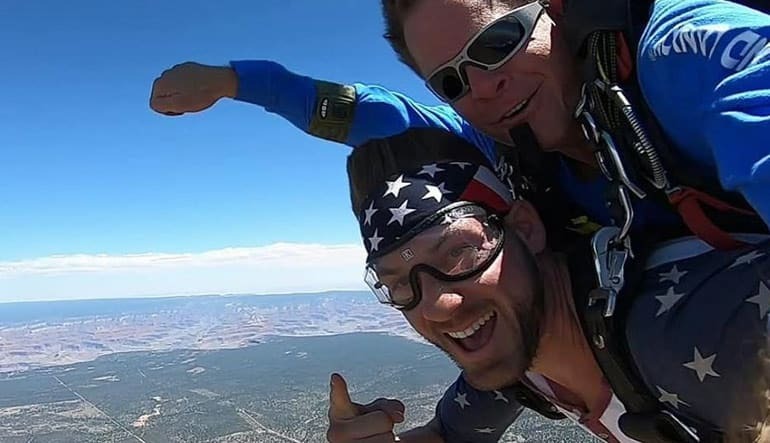 Tandem skydive the Grand Canyon South Rim! Start with a safety lesson—know what you're in for and get familiar with the gear. Get suited up—season-appropriate skydive attire is available to you. Board your plane and take off thousands of feet about the Grand Canyon South Rim. Enjoy a 15 to 20 minute scenic flight to altitude. Approach the open door. Harnessed safely to your tandem diver, you jump! Freefall reaching speeds up to 124MPH! Your tandem diver pulls the chute! Take a breath and appreciate the scenery. Be awed by the world-famous formations as you drift back down to earth! 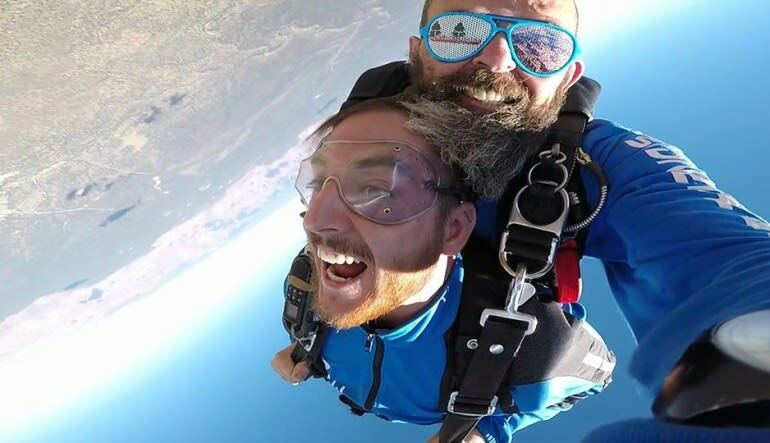 Maybe this is your first skydive. Maybe you’ve been skydiving for decades. Whatever the case, we guarantee that you’ve never experienced an adventure like this before! 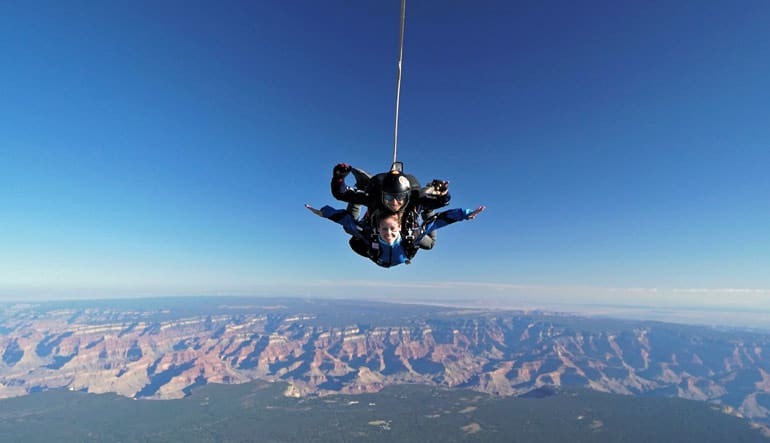 Book your Grand Canyon skydive now!